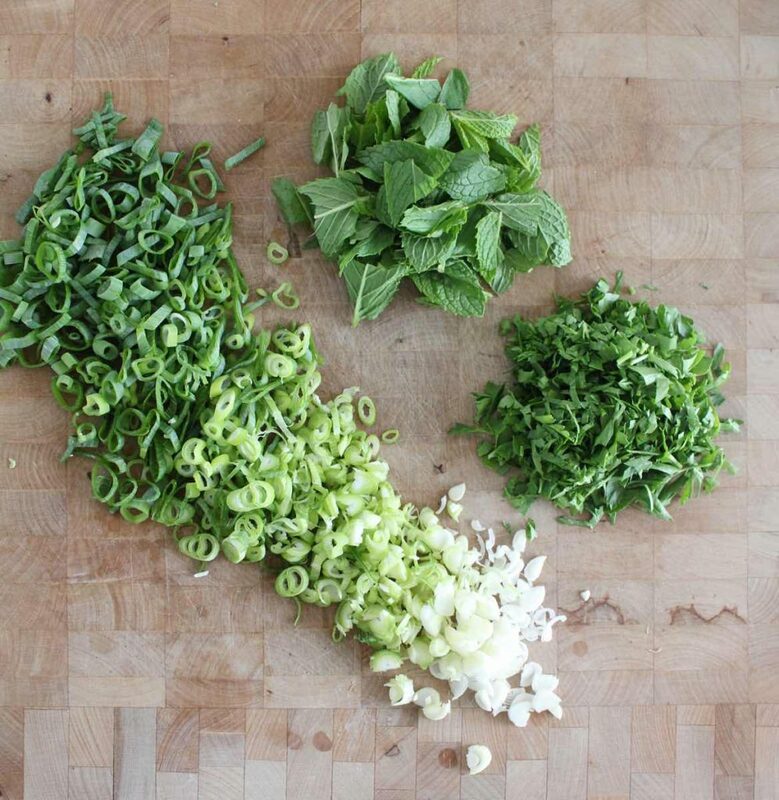 Fresh herbs add flavour, nutrients and digestive support, and you can add whichever ones you’re feeling these days. Try swapping the mint out for dill, cilantro, or tarragon, or just a big handful of fresh chives –this is a good way of changing around the entire taste of the salad so that you don’t get sick of it. If you’re not feeling the distinct taste of herbs these days, try adding some chopped, fresh spinach. 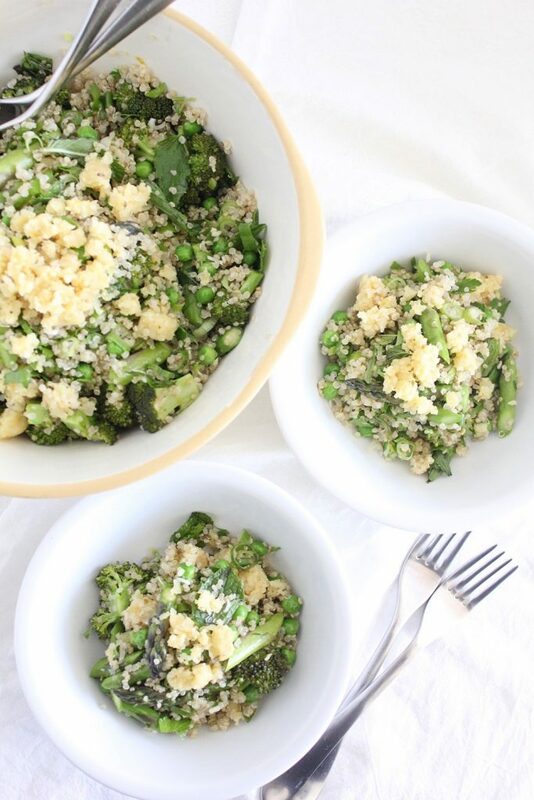 Thanks to the sweet green veggies, this salad really does taste like spring. Not the kind of spring that was happening while I wrote this which required dusting off the rain boots, wearing a toque at home and this bowl of lentil soup. But the hopeful kind of spring day, that warrants a big, sweet-smelling inhale and exhale as you step outside. 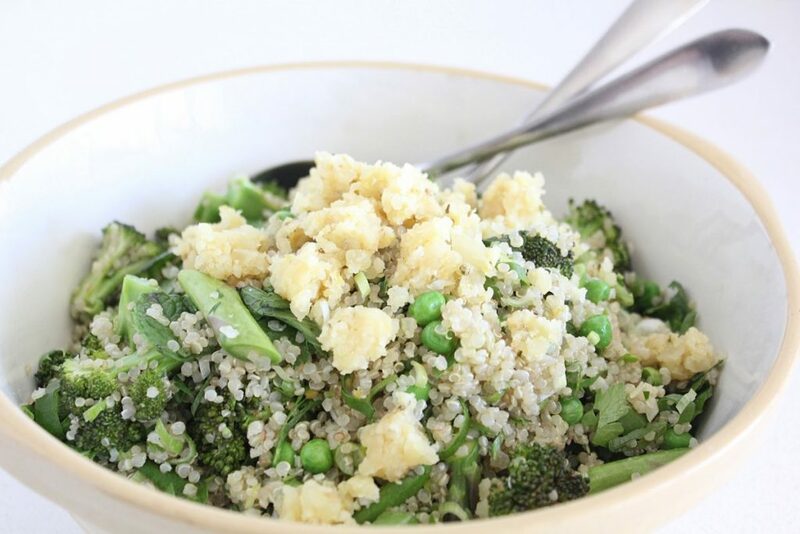 We have used asparagus and broccoli, two famous cancer crushers who get along well flavour-wise. Try other veggies too, especially when asparagus isn’t in season: zucchini, thinly sliced kale or Swiss chard, rapini, cauliflower, radishes or anything seasonal and exciting that catches your eye at the Farmers market. 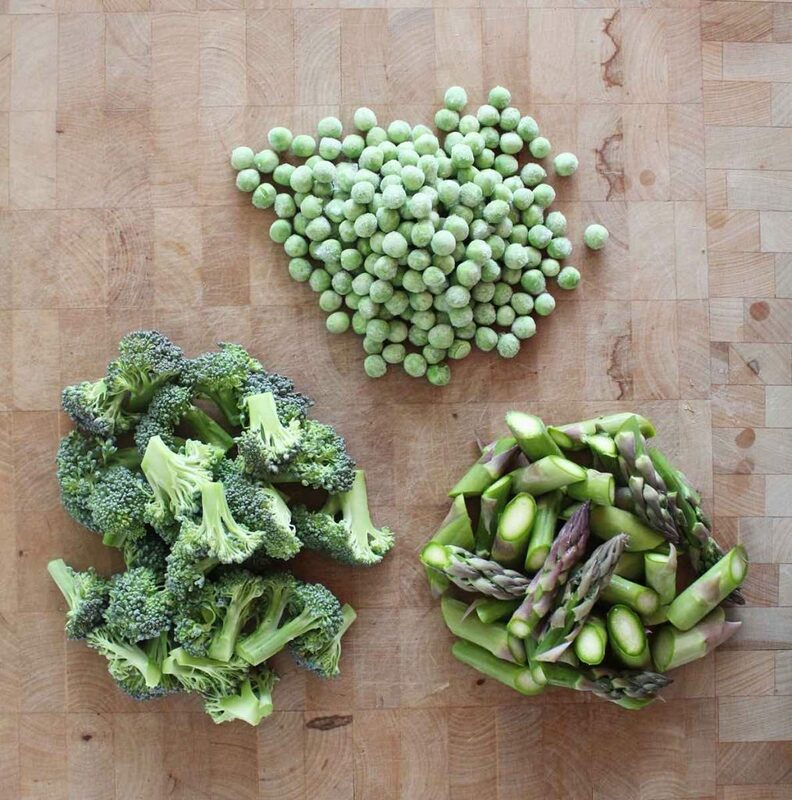 Green peas are rich in calcium, potassium and vitamin A and B vitamins. I’m a fan of frozen peas, I find the flavour is consistent and they are shucked when they are at their pique of freshness (hence their natural sweetness), which also means that their nutrients are at their best. I love shucking fresh peas when they’re in season, but the rest of the year, I don’t hesitate to turn towards good quality frozen ones. Great for a sprained ankle too. I haven’t even gotten to the most fun part yet. I was thinking about adding a healthy fat/protein source and wanted it to be more interesting than a handful of hemp hearts (although, this will do if you’re in a hurry). I call it ‘feta’ and think it goes well with the mint and parsley, but it’s not really feta cheese, it’s briefly blended macadamia nuts. They are really fatty and once blended, stick together, unlike other nuts and seeds. They really do taste rich and decadent and with the help of some tart lemon juice, dried oregano and garlic, take it somewhere vaguely Mediterranean. So kind of like feta cheese. Either way, it’s an interesting and slightly more exotic trip to take your quinoa salad on. And think of all of the different recipes that could be improved by something vaguely feta cheese-ish? Baked Eggplant, Tomato Fennel Soup, Stuffed Grapevine Leaves, Braised Fennel with Chickpeas, Squash and Spinach Salad etc. It also freezes well, so you can pull it out of the freezer as you need it. This salad translates to the rainy kind of spring day too, just warm it up in a small splash of water. It tastes sort of like pasta. Sort of. Put the soaked/drained/rinsed quinoa in a pot and add enough water to not quite cover it. Add the garlic (or add the garlic later, with the herbs, if you want to keep it raw) and a pinch of salt and turn the pot on high. Once it starts to boil, put the lid on top and turn the heat off, leaving the pot on the burner, and leave for 10 minutes. 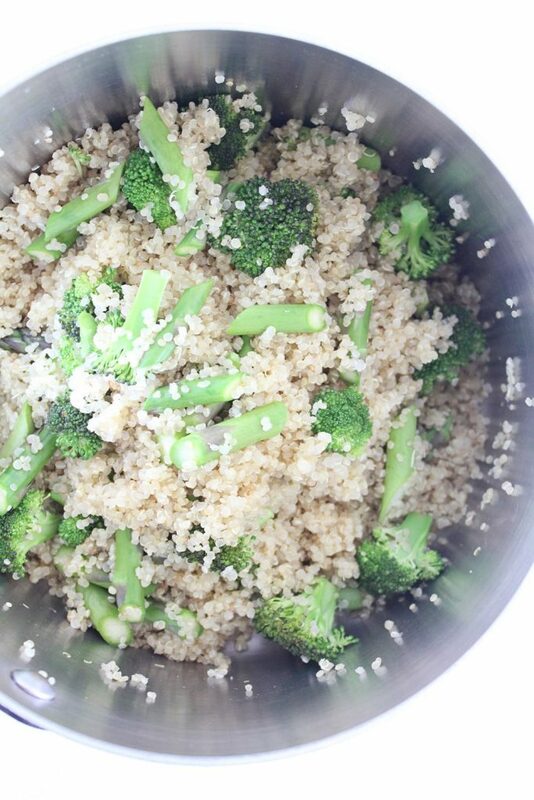 Take the lid off and add the chopped broccoli and asparagus and put the lid back on and leave for ten more minutes. Take the lid off and pour the contents into into a big bowl and stir it all together. 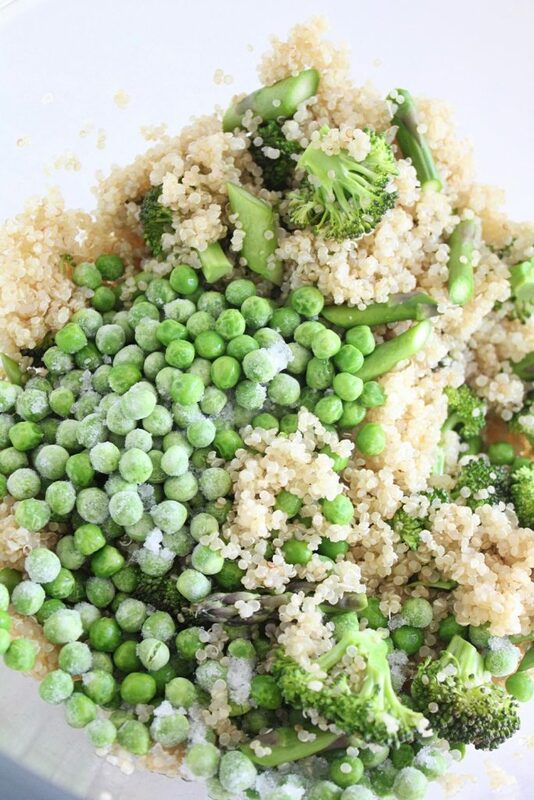 Stir in the peas (if using frozen, throw them in while still frozen). Add the herbs, green onions, olive oil, lemon zest and lemon juice. 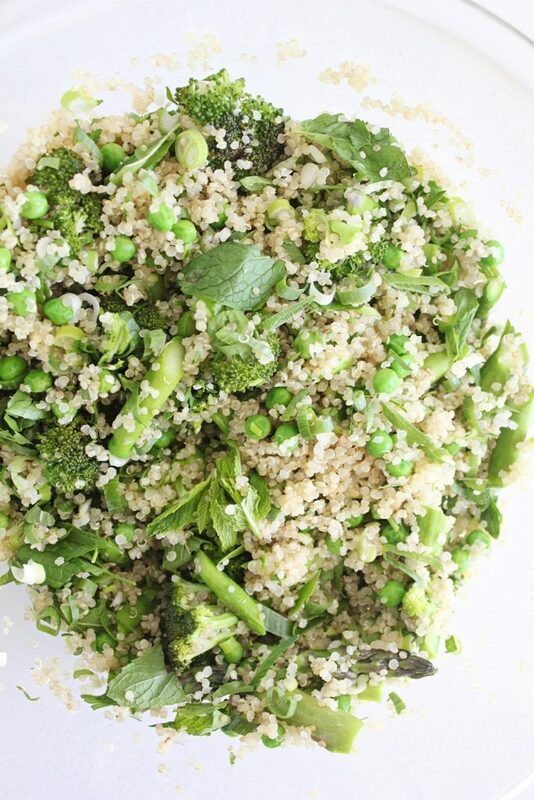 Lasts for 4-5 days in your fridge, but the lemon juice will turn the greens a little bit brown. This doesn't look as pretty, but it's still good to eat. 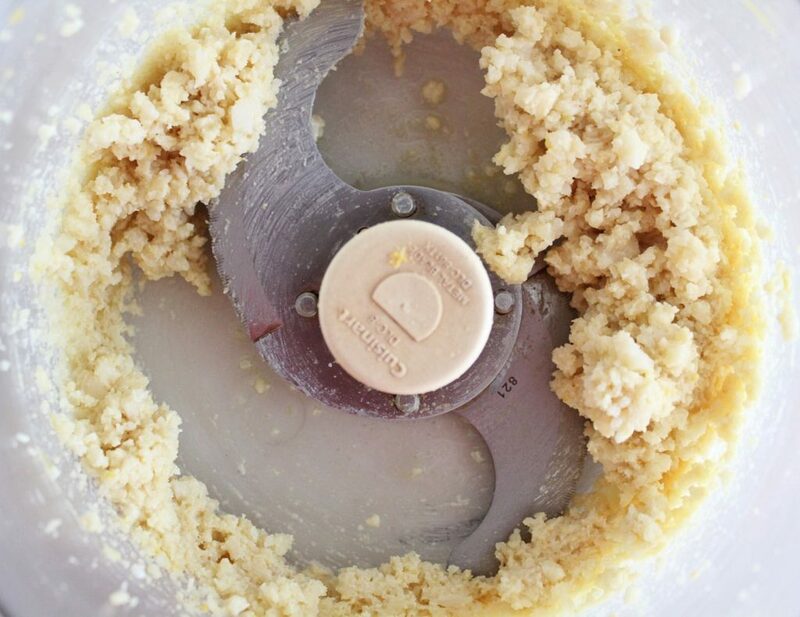 In a food processor, pulse all of the ingredients together until it becomes a chunky, crumbly mixture. Adjust seasoning with sea(weed) salt. This freezes pretty well, and lasts in your fridge, tightly covered for a couple of weeks (because the nuts aren't soaked). This is wonderful, flavourful and delicious. I went looking through your recipes when I found myself with too much mint on my hands, and I’m so glad I made this. 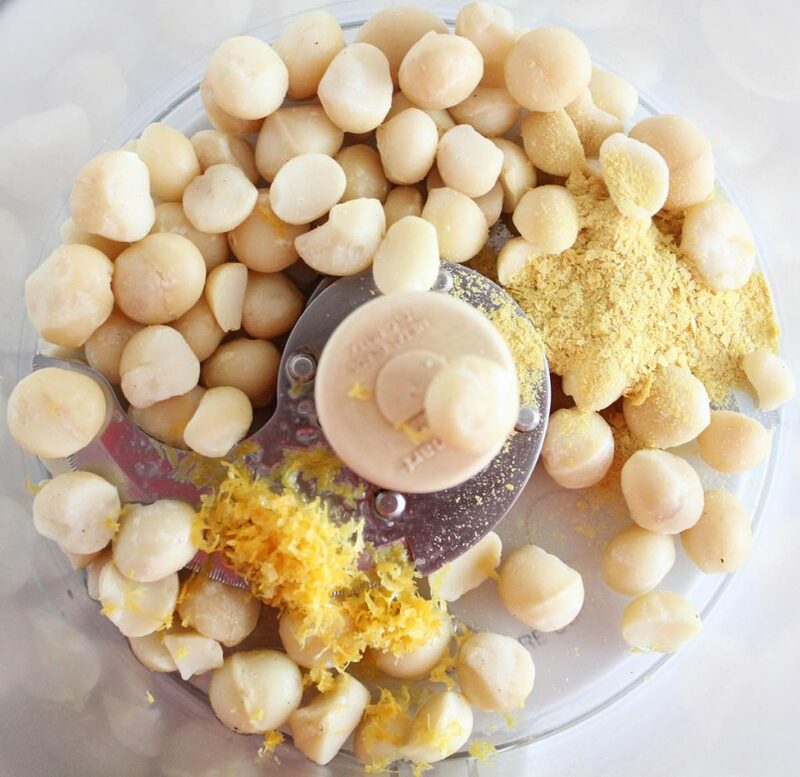 The macadamia nut ‘feta’ makes it first-rate (and I’m a cheese-lover): undeniably scrumptious.